Biologists with the Division of Wildlife Resources are recommending changes that will affect anglers in Utah for the next two years. If the changes are approved, you'd be allowed to use corn as bait at all of Utah's fishing waters, keep more lake trout at Flaming Gorge Reservoir, enjoy a two-day possession limit statewide, and have a better chance at catching big channel catfish at Cutler Reservoir. And that's just the start. The biologists are recommending numerous changes for the 2019 and 2020 fishing seasons. You can see all of their recommendations at www.wildlife.utah.gov/public_meetings/rac/2018-09_rac_packet.pdf. After you've reviewed the ideas, you can share your thoughts with your Regional Advisory Council members by attending your upcoming RAC meeting or by sending an email to them. RAC chairmen will share the input they receive with members of the Utah Wildlife Board when the board meets in Salt Lake City on Sept. 27 to approve rules for Utah's 2019 and 2020 fishing seasons. Over the past two years, anglers have been allowed to use corn on eight lakes and reservoirs in Utah. During that time, DWR conservation officers have kept a close eye on the amount of litter those fishing with corn have left behind. The officers are happy to report that they haven't seen an impact. Randy Oplinger, sport fisheries coordinator for the DWR, says anglers who responded to a survey earlier this year had the same observation. "A total of 1,636 of the 4,718 anglers who responded to the survey had fished at one or more of the eight waters in the past two years," he says. "Only 3% of them had witnessed any kind of negative impact from allowing anglers to use corn as bait." If approved by the Utah Wildlife Board, anglers could use corn�at all of Utah's fishing waters�starting Jan. 1, 2019. Changes at Flaming Gorge Reservoir would give you more chances to help reduce a growing population of smaller lake trout. Reducing the number of smaller lake trout should help the reservoir return to its 'glory days' when it produced some of the largest lake trout in the country in good numbers. 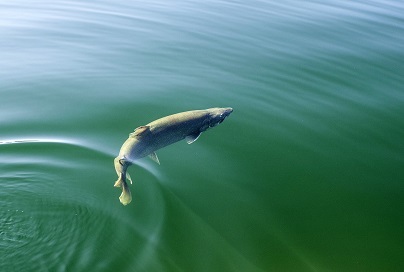 Oplinger says a growing population of smaller lake trout is causing problems for anglers. "The smaller lake trout are competing with kokanee salmon and rainbow trout for food," he says. Oplinger says the competition is affecting both the number and size of kokanee and rainbows in the reservoir. "Kokanee and rainbows are the two fish lake trout prey on," he says. "If we can reduce the number of smaller lake trout, they'll be more kokanee and rainbows for anglers to catch and for the remaining lake trout to eat." Oplinger says Flaming Gorge used to produce good numbers of huge lake trout. "If the increased limit is approved," he says, "and anglers keep their limits of smaller lake trout, we should see more trophy lake trout caught at the reservoir in the future." "With the exception of Flaming Gorge and Strawberry," Oplinger says, "two-day possession limits are allowed at all of the fishing waters in Utah. We haven't seen any biological impact on the waters where a two-day possession limit is allowed. We'd like to give anglers who fish Flaming Gorge and Strawberry the same chance those who fish other waters have." If changes recommended by the biologists are approved, Cutler Reservoir could become 'the place' in Utah to catch big channel catfish.